Happy TS Day everyone! Today’s page was a really fun experience as it was just as much fun to draw as it was to ink and color. Normally one of the three will be a clear winner in the fun department and the other two will fall in the “This has to be done so do it” category. Drawing it was a ton of fun as I got to do a full page of Team Stryker coming through a time portal and landing 60 million years in the past! Not many artists get to do that these days. Inking was memorable only because when I inked this it was summer time and I brought my entire art studio outside and inked it while getting a tan and drinking a beer (that is a good day at work!). The final step being coloring the (normally it would be putting speech bubbles on but I didn’t want anything to take away from the art) was a great learning experience and a huge shout out to Max Dunbar for his help on this one. He was instrumental in getting the effects of the time portal to look the way I wanted it to. Hopefully you all agree with it’s awesomeness. As for future TS news preproduction work as begun on Mission 004! I won’t say more about it until I have some cool stuff to show you but Team Stryker is in it for the long haul and the 4th issue of Team Stryker will be ready for your enjoyment when it issue 3 wraps up early next year. 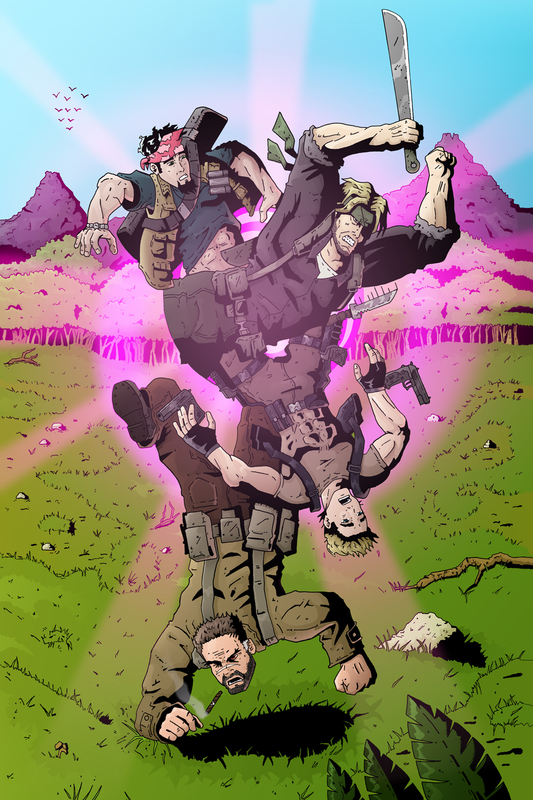 If you want to help Team Stryker keep producing mind blowing comics (and saving the world) you can donate to TS here or check out the TS Store and buy yourself a shirt (or dozen) here. Christmas is right around the corner and nothing says Best Present Ever like a Team Stryker shirt. Have a great Thursday everyone and I’ll see you back here on Monday for the next exciting page of Team Stryker!